It’s that time of year. The evenings are dark, the temperatures are colder. The never-ending election in the States has finally concluded. If you let your imagination go a little, you may notice a certain hint of magic looming in the air as we approach the season of Christmas. Tis the season. Tis the season where you can actually get away with saying the word “Tis” without getting arrested by the word police. It is the season when greatest lists, and favorites-of-the-year lists, and best-of lists for the last 11½ months appear. But yet, for me anyway, there are sad memories in the background particularly early in December, like Pearl Harbor, and John Lennon. But the saddest of all has to be the fact that DeLorean owners in our part of the planet must put their cars away for the next few months! It is a sad experience but one that cannot be avoided. It is a painful task for some of us but one must carry on. Driving our cars on salty roads is not a great idea, and if there is any snow accumulation, you may as well forget about trying to drive our DeLoreans as some of them are quite low to the ground. And there is the question of traction. Can our mega powerful sports cars actually get any traction in slippery conditions? If you slide into first gear, and ease off the clutch will your car actually move or will you just spin your wheels and not move forward at all??? Oh wait…. 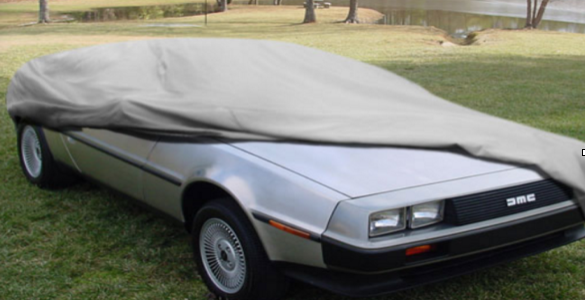 this is a blog about DeLoreans, right? Apologies! Of course you will not just spin your wheels – not enough torque in a DeLorean. They’re torqueless! Sorry about that! Aside from the lack of torque there is the question of tires if you plan on driving in the winter. Personally, I use winter tires every year — on my daily car, that is. I have had the same set for seven winters now and they are still in great condition. Two cars and seven winters. Admittedly, they are only on the car for 5 months each year, but still. How amazing is that? Seven times five months is equal to almost three years of continuous use, and they are still far from worn. Most DeLorean owners do not have winter tires on their DeLorean. This fact will increase the risks involved in attempting to drive a DeLorean in the snow, along with the low profile of the car. All things considered it is no surprise that DeLoreans owners do not use their cars in the winter weather. Putting our cars away for the winter opens up something of a perennial argument among classic car enthusiasts about what is needed to store a car. I am not going to get into it now. I don’t believe there is a definite right and wrong way to do it. Some people do certain things, others do more, while some do less. Of course, this does nothing whatsoever to ease the sadness of parking your DeLorean for the last time this calendar year, knowing that it may be the second quarter of next year before you can drive it again. Those of you who know me, will know that I have another classic car which must go through the same hibernation every winter. So this process is a double whammy for me. Twice the sadness…… twice the pain! When I put my cars away I also have to winterize a bunch of small engines; lawnmowers – several of various sizes, capacities, styles and types. A leaf blower. A chain saw. A couple of edge trimmer/weed whackers. If I ever decided to sell my small engine tools and toys, the fuel stabilizer manufacturers would surely go out of business! But I have found over the years that there is no advantage to be gained by having stale fuel flowing through a lawnmower or a chainsaw in the Springtime. Firing up a small engine that has been asleep for a few months can be tricky at the best of times, but having treated fuel may help the process. So, trying to preserve the quality of the fuel at the beginning of winter seems logical to me – at least for small engine tools. And so the snow will come down. The temperature will come down. Home heating expenses will go up. Ah yes, for some this is a happy, joyous time of year. For others, not so much. For me, it is sadness. Sadness personified. Automotive sadness. It’s like telling a kid that he cannot have fun with his favorite toy for the next few months. What sort of reaction do you think you will get to that? Well I’m that kid, dammit. And I am not pleased! I’m going to my room!